Deborah Wardle is a writer, editor and fulltime PhD student. She has fiction and non-fictional stories published by Spinifex Press, Overland, The Big Issue,Castlemaine Independent and Palliative Care Australia’s online journal E-Hospice. She has peer-reviewed articles in Meniscus Journal, Fusion Journal and forthcoming in Animal Studies Journal. Her short story, ‘ Love Letters’ was shortlisted for the Josephine Ulrick Prize in 2016. What if it turned out that we weren’t just bodies with brains, but embodied souls, and that this explained a whole lot about our psychology and the fundamental nature of reality? In Mind Beyond Matter, Dr Gavin Rowland tackles perhaps the greatest scientific mystery of all—the problem of consciousness. 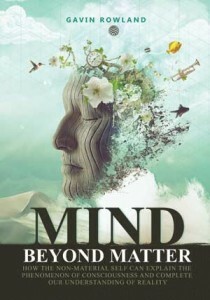 He analyses the subject in depth and finds convincing evidence that the mind is a non-material thing. In the process, he develops a new science of the non-material, and a new understanding of the mind, of mental illness, of spirituality and of God. Dr Rowland is a general medical practitioner with a special interest in mental health. He lives in Australia.